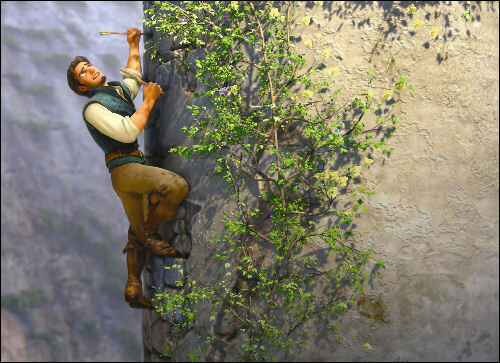 Rapunzel (Mandy Moore), a beautiful and feisty tower-bound teen with 70 feet of magical, golden hair takes the kingdom’s most wanted and most charming bandit, Flynn Rider (Zachary Levi), hostage when he hides out in the mysterious tower. After being locked up in the tower for years, Rapunzel makes a deal with Flynn to help her escape, resulting in an action-packed escapade, complete with a super-cop horse, an over-protective chameleon and a gruff gang of pub thugs. Tangled is a Walt Disney Pictures film that will be in theaters in Disney Digital 3D™ on November 24, 2010.